Shares of SunCoke Energy Partners, Natural Resource Partners, Quad/Graphics, CNX Coal Resources, and CONE Midstream Partners have all seen big stock-price gains in 2016, on top of their very generous dividends. The only thing better than a stock that generates triple-digit gains in a year is a stock that generates triple-digit gains while also paying a high-yield dividend. In 2016, there have been only a handful of stocks that fit this description. Here's a look at the five best-performing high-yield dividend stocks for 2016 (as of November), how each was able to produce such outsized gains over the broader market, and whether these gains signal that it's time to buy or to stay away. The first thing that jumps out from this list is that three of the companies are master limited partnerships in the coal business: SunCoke Energy Partners and CNX Coal Resources LP are MLP spinoffs of SunCoke Energy (NYSE: SXC) and CONSOL Energy (NYSE: CNX), respectively, while Natural Resource Partners' largest revenue source is royalty rights on coal properties across the U.S.
CONE Midstream Partners is a master limited partnership formed by CONSOL Energy and Noble Energy (NYSE: NBL); it focuses on natural gas gathering and processing for CONSOL and Noble's acreage in the Marcellus and Utica shale basins in the northeastern United States. The outlier in this group is Quad/Graphics. The company is a specialized commercial printer that generates a majority of its revenue from printing retail inserts, magazines, catalogs, and direct mail. For Natural Resource Partners, SunCoke Energy Partners, and CNX Coal Resources, the turnaround has come almost exclusively from a turnaround in coal prices, especially metallurgical coal. Major supply cuts from China, as well as supply disruptions globally, have sent the price of the steel-making coal up more than 150% in the past six months. This has been especially important for SunCoke Energy Partners, since its operations entail preparing and transporting coking coal produced by the parent company. It should also be noted that the parent company has recently proposed that it buy all outstanding shares in SunCoke Energy Partners, to reintegrate the company into a single entity. CONE Midstream's big uptick this year has to do with improving natural gas prices and drilling activity in the Marcellus region. Gathering and processing assets are some of the most price- and volume-sensitive energy infrastructure and logistics assets, since they are linked to individual wells. As prices have started to pick back up, so too have volumes in CONE's system that have led to improving financials this quarter. Quad/Graphics' issues come down to the fact that the printing business simply isn't what it used to be. Even after making 12 major acquisitions over the past six years to consolidate the industry, Quad's sales peaked in 2014, and 2016 revenue is expected to be down 8% from that high mark. Printing capacity across the entire industry is down, and pricing power is deteriorating. Quad, though, has been able to offset these declines this year by significantly lowering costs and lowering its capital working requirements to generate better bottom-line results. 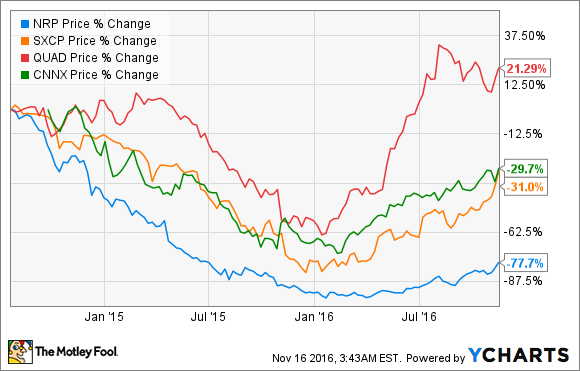 For SunCoke and Natural Resources Partners, the gains in metallurgical coal prices are likely short-lived. Some of those gains came from supply disruptions that will likely be corrected in coming quarters, which will send prices for that particular type of coal back down again. CONSOL Energy spun off its coal assets into CNX Coal Resources specifically because it doesn't intend to spend much money on expanding its coal business. While there is still a lot of life left in its existing mines, chances are there won't be many new mines added to the portfolio soon. For CONE Midstream, the recent ending of CONSOL and Noble Energy's production joint venture in the Marcellus and Utica formations could be problematic. These two companies are CONE's only customers, and having that much exposure to only two companies can be problematic if only one shifts its production strategy away from the Marcellus region. For Quad/Graphics, the gains in operational efficiency are a good sign because they improve the company's free cash flow situation. With so much overcapacity in the market for commercial printing and a very fragmented market, Quad can use that cash to continue to consolidate the market, hopefully gain back some pricing power, and fight off the long-term trend toward less print media. If you were able to time the market just right with these companies and you held onto those stocks throughout 2016, then you are probably sitting on pretty large gains. Anyone who has been invested in these companies any longer than that, though, is probably still trying to claw back those massive losses over the past few years. There are some market forces that suggest these companies are headed for better times ahead, and the high-yield dividends of these companies may not be in as much jeopardy as they were just a few months ago. Still, some of the gains we have seen from these companies could be short-lived, and for the investment thesis for each to play out, a few things out of each company's control will need to go right. Without assurance that this is the case, investors should approach these companies with a bit of caution.